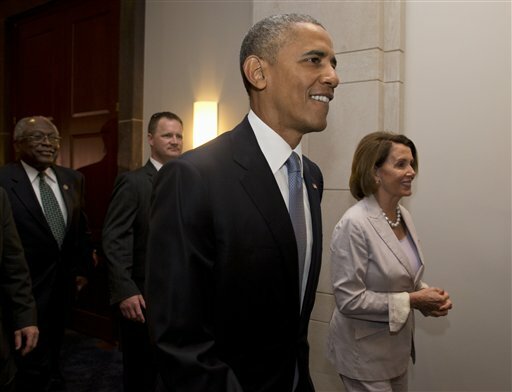 WASHINGTON (AP) — With a last-minute trip to the Capitol, President Barack Obama sought to quell a revolt Friday among House Democrats threatening to torpedo top-priority legislation to strengthen his hand in global trade talks. Cheers greeted the president as he strode into a meeting that could make or break a key second-term priority. But it was converts he needed to assure success of a bill to let him complete global trade deals that Congress could approve or reject but not change. With a scheduled vote nearing, several Democrats quoted the president as urging lawmakers to “play it straight” with their votes. That was an appeal for them to vote for a package of assistance for workers who lose their jobs as a result of trade — even if it means ultimate passage of the entire trade bill, which many of them strongly oppose. It was unclear how much progress he made, if any, particularly among lawmakers who sought to kill the aid package as a way of stopping the trade measure from going forward. He met privately first with Rep. Nancy Pelosi of California, the House Democratic leader who remained publicly uncommitted on the measure. She and numerous fellow Democrats met privately after Obama’s departure back to the White House. Obama’s visit relegated debate on the House floor almost to the status of a sideshow. Other presidents have had the authority Obama seeks, which is dubbed “fast track.” The White House wants the legislation as it works to wrap up a round of talks with 11 Pacific Area countries. Business groups like the Chamber of Commerce crave the deal; labor unions are ardently opposed, pointing to job and wage losses from earlier trade pacts opponents say never lived up to the hype from previous administrations. Those colliding interests have produced unusual alliances on Capitol Hill, with House Republicans working to help a president they oppose on nearly every other issue, and most Democrats working against him. Yet in a convoluted series of events Thursday, the fast-track bill, long the main event, seemed to fade in importance even as Republicans began sounding confident it would command enough votes to pass. Instead, Democrats began eyeing the possibility of taking down the related Trade Adjustment Assistance bill — a maneuver that would be made possible only because of rules in place for House debate. Republicans said that the sequencing was determined at Pelosi’s behest. She has worked behind the scenes with House Speaker John Boehner, R-Ohio, this week to solve a last-minute hang-up involving Democratic concerns about cutting Medicare funds to pay for worker retraining. Associated Press writers David Espo, Darlene Superville, Jim Kuhnhenn, Alan Fram, Laurie Kellman and Andy Taylor contributed to this report.